Bart Yasso joined Runner’s World in 1987 to develop the groundbreaking Runner’s World Race Sponsorship Program, creating a vehicle for Runner’s World to work with over 7,000 races representing 4 million runners per year. Inducted into the Running USA Hall of Champions, Yasso is has made his mark in the running world and is the author of My Life on the Run. Dubbed the “Mayor of Running,” Bart Yasso is one of the best-known figures in the sport, but few people know why he started running competitively, how it changed his life, or how his brush with a crippling illness nearly ended his career a decade ago. 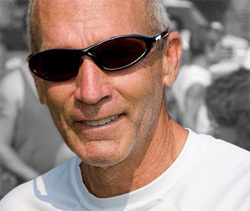 My Life on the Run chronicles the heatstroke and frostbite, heartache and triumphs he’s experienced while competing in more than 1,000 competitive races during his nearly 30 years with Runner’s World magazine. Bart will be giving running tips each month, so please keep checking back for these tips. If you have a question about running, send us an email and we will address it on our site. Tip #1 : Start where you are!!! If you’re training for your first 10k, you should be aiming just to get to the starting line feeling fit and injury-free, and get to the finish line having enjoyed the experience enough to want to do it again. If you’ve gone 6.2 miles before, then it’s shoot for time goals. No matter how experienced you are, it’s important to base your goals on your current level of fitness.